Does your skin care routine already include a serum? If not, then here you learn why a serum is a wonderful accompaniment to your skin care products. A serum contains a high concentration of extremely effective ingredients, aimed at optimising the effect of your skin care products. So if you would like to enhance the effect of your day cream, you should supplement it with a serum. You need to apply your serum on freshly cleansed skin and allow it to penetrate completely before applying your day cream. Serums are often overlooked when it comes to skin care. Typically it is because many do not know what it does, and therefore, how it differentiates from a regular face cream. A serum is not a type of cream. It is a light – often watery – sort of gel, that penetrates the skin much deeper than a face cream. The gel also helps much more specific problems than a face cream. While face creams contain many different ingredients, serums contain only a few, making them better at targeting more specific problems than a moisturiser. A serum should be used under a day cream that can protect the skin and retain moisture. It should not be used without a face cream, because it does not contain any fats to protect the skin from outer influences. A serum contains much smaller molecules than a moisturiser, which enables it to penetrate the skin much deeper. It can, therefore, transport the active ingredients much deeper under the surface of the skin – where it will really have an effect. It also contains a much more concentrated amount of the nourishing ingredients that enables it to give a much more focused treatment of specific problems. How does it differ from face creams? A face cream can also contain ingredients that target specific problems, but usually they contain ingredients that target more problems than only one. For example, you might have a face moisturiser for dry skin that also treats acne at the same time. Targeting more problems in a face cream is really effective, because you treat more problems at once. A day cream also contains more ingredients than a serum. This means that the amount of ingredient for a specific problem will be limited, because there has to be room for the other ingredients as well. A face serum on the other hand has a much more concentrated amount of the ingredients making it really effective if you target specific problems. How do you apply serum to your face? A serum is always applied after using a cleansing product and before you apply your everyday face moisturiser. Always make sure to cleanse your skin thoroughly before applying the gel to assure that the high concentration of active ingredients can penetrate the skin. 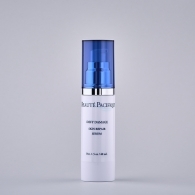 To boost the effect of your skin care products you can use a face mist before applying the serum. The gel is very economical in use, because you only need a small drop of the product to cover your entire face. Gently spread the product on your face – avoiding the eye area – and let dry for a moment. Afterwards, you can apply your face cream. It is important to always use a serum under your face cream and not the other way around, because the cream have a barrier-function that will stop the gel from penetrating the skin. You can use as many serums as you want at the same time. This might be helpful if you have more than one skin problem that you are dealing with. Our selection of serums contain Squalane oil, which is an oil that is already a part of our skin. 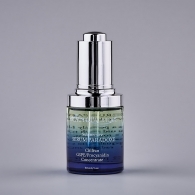 The oil helps transfer the active ingredients deep under the surface of the skin. Squalene is also extremely softening for the skin. We add Squalane oil to our skin care products in order to help the active ingredients penetrate the skin much more deeply, and therefore repair from within, what has been ruined. Traditionally speaking, a serum is applied under your day cream, but if you add a bit to your makeup you will notice a more even distribution of the makeup. And it gives you a special glow. Just add a few drops to your makeup on top of your hand. Mix them together before applying to your face.